I am currently advertising a funded PhD position titled: “The role of camouflage in the survival and conservation of ground-nesting birds“. Apply here! Human activity influences the visual appearance and physical structure of almost all habitats in the UK. The behaviour, movement and survival of many animals depends critically on their camouflage and ability to go unnoticed by visually guided predators. Changes in land-use practice could therefore interfere with an animal’s defensive camouflage and anti-predator behaviour; making them more easily found by predators, or less likely to remain in a location that doesn’t offer adequate camouflage. For many ground nesting birds camouflage is their only line of defence, making them highly vulnerable to land-use change. The UK’s Northern lapwing (Vanellus vanellus) population has declined by 80% since 1960, and increased predation by visually guided predators is thought to be a contributing factor to their survival. Research into animal camouflage has grown considerably in recent years thanks to advances in our understanding of the mechanisms underpinning different camouflage strategies, and novel in imaging techniques. This project will make use of these advances to investigate the importance of camouflage in the behaviour and survival of lapwings and other ground-nesting birds using a range of field studies and controlled experiments. The project’s findings will contribute to the development of land-use strategies which aid the survival of locally endangered species, and more generally will contribute to our understanding of how human activity affects the evolved anti-predation adaptations of animals. Farming practice dramatically alters the visual appearance and physical structure of a ground-nesting bird’s habitat (left and centre images). The survival of species such as the red-listed Northern lapwing (right) depends on background appearance and camouflage, which in turn affects their behaviour (due to perceived predation risk) and vulnerability to visually-guided predators. • Determine how different land-use techniques affect the camouflage of ground nesting birds. • Test which aspects of camouflage best predict nest survival in the wild. • Determine how camouflage affects the perceived predation risk and behaviour of adult birds and chicks (e.g. selection of nesting location, and anti-predator behaviour). • Establish a causal link between specific aspects of land-use strategies and camouflage efficacy using controlled predation experiments. • Identify and develop new land-use strategies which attract ground nesting birds, compliment their camouflage, and improve their survival chances. There is considerable scope within this project for the doctoral researcher to assist in developing the overall research direction and experimental designs. The project will partner with the Game and Wildlife Conservation Trust’s established nest monitoring study system, which locates and tracks a 150-200 nests each season. A range of experimental designs and cutting-edge techniques for camouflage analysis will be used. Naturalistic data on real nest camouflage will be collected from the wild study system, using calibrated animal-vision imaging and 3D scanning techniques to determine which aspects of camouflage, light environment and three-dimensional habitat structure correlate best with clutch survival, and which visual characteristics of a background the birds use when selecting a nesting location. Controlled predation experiments using artificial prey can then be used to test specific hypotheses on how different types of habitat and lighting interact with specific types of camouflage. These experiments can make use of 3D printing, animal-vision calibrated colour printing, and light-environment data logging. This project will involve analysing the camouflage of ground-nesting birds (nests, chicks and adults), using calibrated digital imaging and various types of visual modelling. 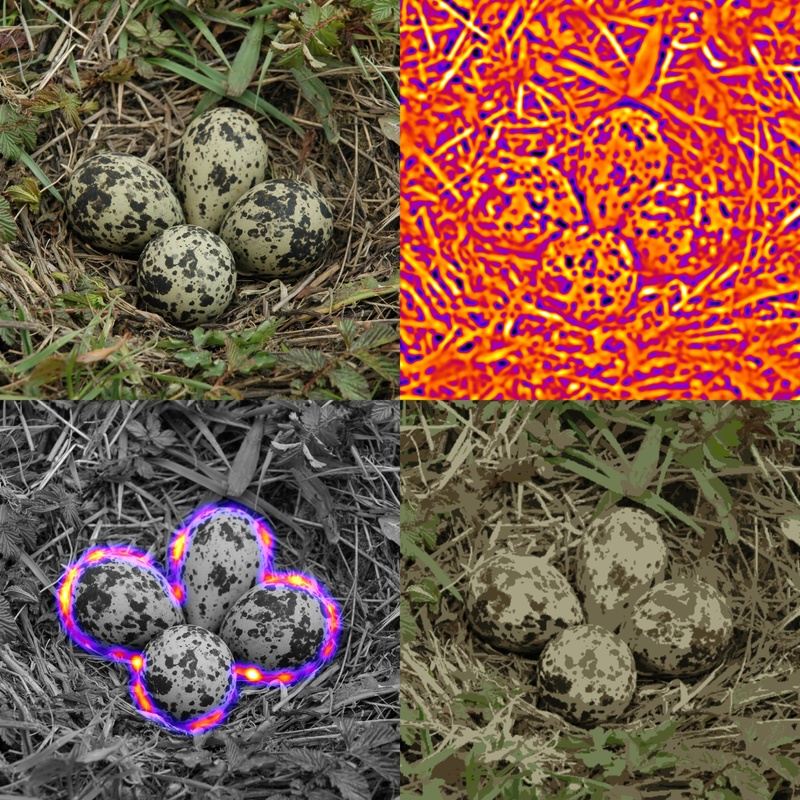 These examples show (clockwise from top left): a lapwing nest; bandpass filtering techniques; colour quantisation and modelling; and edge disruption analysis. This project would suit a researcher with a passion for understanding evolved adaptations, how animals can survive in a rapidly changing world, and the mitigation strategies we humans can use. An excellent undergraduate degree in a relevant area is essential (e.g. biological sciences, zoology), as is a desire for extensive fieldwork, and an ability to learn new skills, and excellent written and verbal communication. The Game and Wildlife Conservation Trust is a leading conservation charity in the UK for improving biodiversity and developing land management practice. 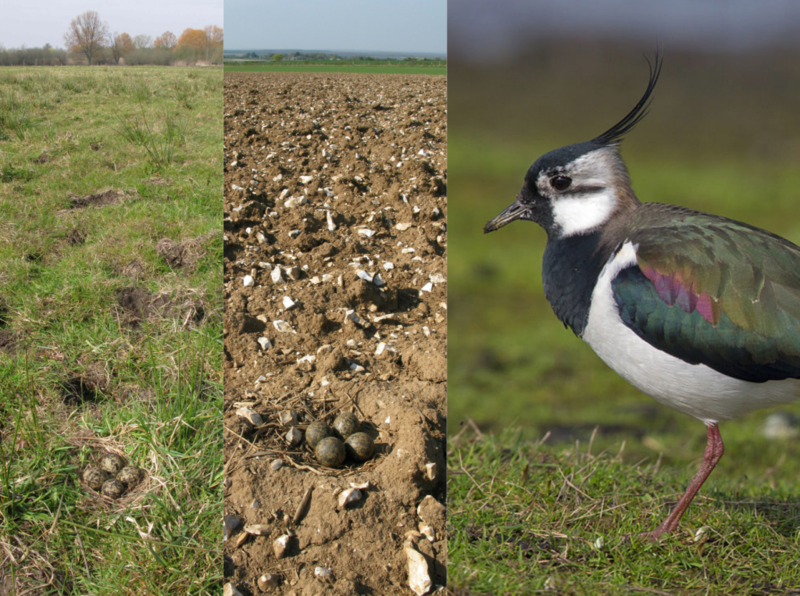 The GWCT has been running a lapwing nest monitoring study in the Avon valley for 11 years, providing an ideal system for researching survival and camouflage. In addition the GWCT will be able to offer expertise in understanding land management techniques and developing farming policy advice. The researcher will receive training in experimental design, image analysis techniques and statistical analysis from Troscianko (Exeter) and Cuthill (Bristol). This will include using a range of novel methodologies such as calibrated UV-visible digital imaging, animal-vision image analyses, 3D scanning, 3D printing, calibrated printing and data-logging. The researcher will also develop fieldwork experience and techniques relevant to practical conservation research and agricultural land-use from Hoodless (GWCT). Written and verbal communication will be developed through participation in lab meetings, writing papers and attending international conferences. The wide range of methodologies used and transferable skills developed during this PhD could be used to pursue a career in academia or industry. Please email for PDFs if required (j.troscianko@exeter.ac.uk). • Cuthill, I. C. et al. Optimizing countershading camouflage. PNAS 113, 13093–13097 (2016). • Merilaita, S., Scott-Samuel, N. E. & Cuthill, I. C. How camouflage works. Phil. Trans. R. Soc. B 372, 20160341 (2017). • Stevens, M., Troscianko, J., Wilson-Aggarwal, J. K. & Spottiswoode, C. N. Improvement of individual camouflage through background choice in ground-nesting birds. Nature Ecology & Evolution 1, 1325 (2017). • Troscianko, J., Wilson-Aggarwal, J., Stevens, M. & Spottiswoode, C. N. Camouflage predicts survival in ground-nesting birds. Scientific Reports 6, 19966 (2016).